Leave the celeriac whole but make sure you give it a wash to remove any dirt that gets caught in the skin, trim off any troublesome bits. Place directly on to the oven shelf and roast for 1.5 hours or until soft when you give it a squeeze. Remove from the oven and allow to cool for at least 30 minutes. Peel off the skin and cut the celeriac in to good sized wedges and set aside. Melt the butter in a small saucepan until foamy and add the hazelnuts, continue to cook over a medium heat until the nuts are golden and a beautiful nutty aroma fills the air. Tip into a bowl and allow to cool slightly. 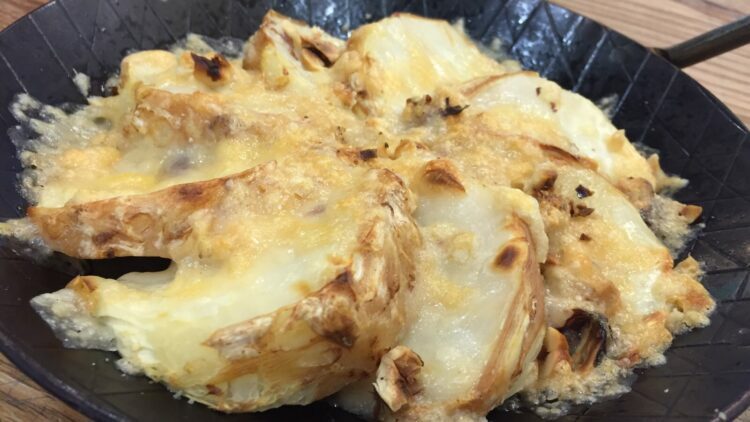 Place your celeriac wedges in a heatproof dish of any size, but ensure they don’t overlap too much. Spoon over the toasted hazelnuts, shave over the parmesan using a microplane or a cheese grater and place under a hot grill until golden. Season with sea salt, the chives and a squeeze of lemon juice. Eat by itself or serve with absolutely anything you like.